N 52° 9' 2" and E 9° 57' 4"
Hildesheim in Lower Saxony with it's 103,052 residents is a town located in Germany about 148 mi (or 239 km) west of Berlin, the country's capital place. Time in Hildesheim is now 01:40 AM (Sunday). The local timezone is named Europe / Berlin with an UTC offset of 2 hours. We know of 12 airports nearby Hildesheim, of which 5 are larger airports. The closest airport in Germany is Hannover Airport in a distance of 24 mi (or 39 km), North-West. Besides the airports, there are other travel options available (check left side). There are several Unesco world heritage sites nearby. The closest heritage site in Germany is St Mary's Cathedral and St Michael's Church at Hildesheim in a distance of 0 mi (or 1 km), North-West. We collected 1 points of interest near this location. Need some hints on where to stay? We compiled a list of available hotels close to the map centre further down the page. Being here already, you might want to pay a visit to some of the following locations: Harsum, Diekholzen, Giesen, Algermissen and Westfeld. To further explore this place, just scroll down and browse the available info. Let's start with some photos from the area. 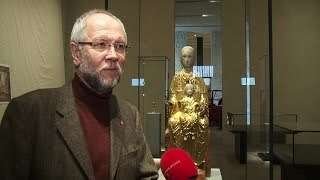 Das Hildesheimer Dommuseum birgt einen der bedeutendsten Kirchenschätze der abendländischen Kunst. Mitte April wird das Museum nach mehrjähriger Renovierung wiedereröffnet. Prof.
Flug um und über Hildesheim: Hasede - Himmelsthür - Bockfeld - Moritzberg - Godehardikamp - Berghölzchen. 1992 war ich in Hildesheim auf dem Markt Platz. Ich war sofort begeistert von der schönen Stadt und dem Markt. Vor allem hat mich das Knochenhaueramtshaus begeistert. 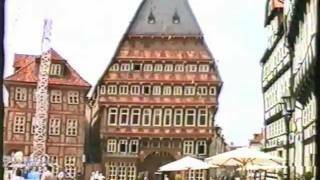 Hildesheim is a district (Landkreis) in Lower Saxony, Germany. It is bounded by (from the north and clockwise) the districts of Hanover, Peine, Wolfenbüttel, Goslar, Northeim, Holzminden and Hamelin-Pyrmont. Located at 52.08, 9.92 (Lat. / Lng. ), about 5 miles away. The University of Hildesheim was founded in 1978. Its main faculties are educational and social sciences, cultural sciences and aesthetic communications, and information and communication sciences. With around 5000 students currently enrolled, this university is relatively small. Unlike very few other German universities, the U. o. H. has become a foundation under public law on January 1, 2003. Located at 52.1333, 9.975 (Lat. / Lng. ), about 2 miles away. The M'era Luna is a festival of goth, metal and industrial music. It is held annually on the second weekend of every August, in Hildesheim, Germany at Flugplatz Hildesheim-Drispenstedt, a former British Army airbase. The M'era Luna includes camping facilities and has two stages: a large rock festival style structure, erected for the show each year, and a former aircraft hangar. There have been some complaints about the acoustics in the hangar venue. Located at 52.1797, 9.94889 (Lat. / Lng. ), about 2 miles away. The Church of St. Michael is an early-Romanesque church in Hildesheim, Germany. It has been on the UNESCO World Cultural Heritage list since 1985. Located at 52.1529, 9.9435 (Lat. / Lng. ), about 0 miles away. St. Mary's Cathedral is a medieval Catholic cathedral in Hildesheim, Germany, that has been on the UNESCO World Cultural Heritage list since 1985. The cathedral church was built between 1010 and 1020 in Romanesque style. It follows a symmetrical plan with two apses, that is characteristic of Ottonian Romanesque architecture in Old Saxony. Located at 52.1489, 9.94722 (Lat. / Lng. ), about 0 miles away. 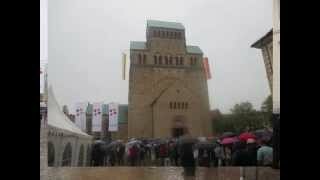 The Roemer- und Pelizaeus-Museum Hildesheim is a museum in Hildesheim, Germany. Mostly dedicated to Ancient Egyptian and Ancient Peruvian art, the museum also includes the second largest collection of Chinese porcelain in Europe. Furthermore, the museum owns collections of natural history, ethnology, applied arts, drawings and prints, local history and arts, as well as archeology. Located at 52.1497, 9.94417 (Lat. / Lng. ), about 0 miles away. The St Andreas Church is the principal Lutheran church of Hildesheim, Germany, not to be confounded with the Catholic Hildesheim Cathedral. Its tower is 114.5 metres tall, making it the tallest church tower in Lower Saxony; it is accessible (364 steps) and offers a panoramic view of both the city and surrounding countryside. Located at 52.1517, 9.95 (Lat. / Lng. ), about 0 miles away. Marienrode Priory is a Benedictine nunnery in Marienrode, a district of Hildesheim in Germany. An Augustinian monastery was founded here in 1125 by the Bishop of Hildesheim, Berthold I von Alvensleben, in a place then known as Baccenrode. It lasted until 1259. The site was re-settled later, at first by Augustinians and afterwards as a Cistercian monastery. The Cistercians gave the community its current name of Marienrode which has officially been used since 1439. Located at 52.1139, 9.91444 (Lat. / Lng. ), about 3 miles away. 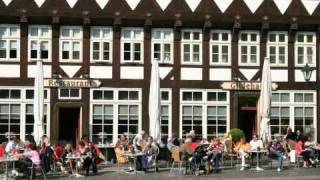 Emmerke is a part of the municipality of Giesen in the district of Hildesheim, Lower Saxony, in north-western Germany. Located at 52.1833, 9.86667 (Lat. / Lng. ), about 4 miles away. Located at 52.05, 9.9 (Lat. / Lng. ), about 7 miles away. The Hildesheim Forest is a range of hills up to 359 m above sea level in the district of Hildesheim in the German state of Lower Saxony. Located at 52.0833, 9.9 (Lat. / Lng. ), about 5 miles away. The Upended Sugarloaf is a half-timbered house in the city of Hildesheim in the federal state of Lower Saxony in Germany. Located at 52.1522, 9.95 (Lat. / Lng. ), about 0 miles away. Located at 52.1528, 9.9517 (Lat. / Lng. ), about 0 miles away. The Butchers' Guild Hall is a half-timbered house in Hildesheim in the federal state of Lower Saxony, Germany. Today the Butchers' Guild Hall houses a restaurant and the City Museum. Every year, a traditional Christmas Market is held in front of the Butchers' Guild Hall. It starts in the last week of November and runs through to Christmas Eve. Traditional products and handicrafts, Christmas merchandise and local delicacies are offered. Located at 52.1528, 9.95139 (Lat. / Lng. ), about 0 miles away. Steuerwald Castle (Burg Steuerwald) is a Romanesque castle in Hildesheim, a city in Lower Saxony, Germany. The castle is currently used by a private riding club and is not open to the public. There are plans to convert the castle into a cultural centre and to use it for exhibitions and concerts afterwards. The roofs of the Romanesque palace and of several other buildings were renovated in 2010. Located at 52.1692, 9.9275 (Lat. / Lng. ), about 2 miles away. 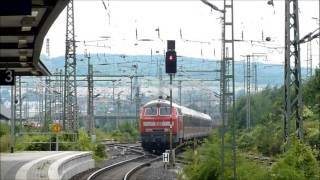 |} The Hildesheim loop, also known as the Sorsum curve or the Hildesheim curve, is a 3.7 km long German passenger railways. It is single-track and electrified throughout. The line was opened in 1991. Located at 52.1564, 9.86806 (Lat. / Lng. ), about 4 miles away. Hildesheim Central Station (Hildesheim Hauptbahnhof) is a railway station in the German city Hildesheim. It is used by trains of Deutsche Bahn and Euro Rail. Trains stopping in Hildesheim are Hanover S-Bahn services, regional services and the hourly Intercity-Express trains running between Frankfurt am Main and Berlin (lines 11 and 12). Located at 52.1606, 9.95389 (Lat. / Lng. ), about 1 miles away. The Hildesheim Treasure, unearthed on October 17, 1868 in Hildesheim, Germany, is the largest collection of Roman silver found outside imperial frontiers. Most of it can be dated to the 1st century AD. The trove consists of about seventy exquisitely crafted solid silver vessels for eating and drinking and is now kept in the Antikensammlung Berlin. Located at 52.1422, 9.97222 (Lat. / Lng. ), about 1 miles away. 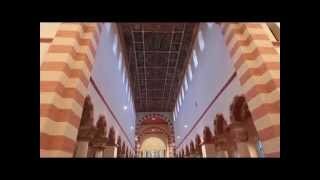 St. Bernward's Church is a catholic church in the city of Hildesheim in Lower Saxony, Germany. The name refers to the bishop Bernward of Hildesheim (960-1022) who was canonized by Pope Celestine III. Located at 52.1569, 9.94917 (Lat. / Lng. ), about 0 miles away. St. Nicolai's Chapel is a former Catholic parish church in the city of Hildesheim in Lower Saxony, Germany. It is in the southern part of the old city center, opposite St. Godehard's Church. Located at 52.1458, 9.94944 (Lat. / Lng. ), about 0 miles away. 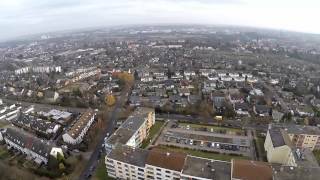 Moritzberg is a quarter in the city of Hildesheim in Lower Saxony, Germany. It is on a hill in the west of the city, about a mile from the Cathedral. It was an independent market town until 1911. Located at 52.1506, 9.91722 (Lat. / Lng. ), about 1 miles away. Lamme is a river of Lower Saxony, Germany. Located at 52.1, 10.0333 (Lat. / Lng. ), about 5 miles away. Beuster is a river of Lower Saxony, Germany. Located at 52.1167, 9.98333 (Lat. / Lng. ), about 3 miles away. The Giesen Hills are a ridge, up to 162.6 metres high, in the district of Hildesheim in the German state of Lower Saxony. Located at 52.1833, 9.89167 (Lat. / Lng. ), about 3 miles away. The 1st Mechanized Infantry Brigade in Hildesheim was a formation in the Bundeswehr, which was subordinated to the 1st Armoured Division in Hanover. The Brigade was disbanded on 31 December 2007. During its lifetime the Brigade was stationed between the Lüneburg Heath, Harz Mountains, the Solling hills and the River Weser. Located at 52.1541, 9.97101 (Lat. / Lng. ), about 1 miles away. These districts belong to Hildesheim. These are districts that are close by, but belong to a different city than Hildesheim. These are some bigger and more relevant cities in the wider vivinity of Hildesheim.